Amour Blu-ray Review Amour is as heartbreaking as it is brilliant. Michael Haneke’s masterpiece approaches a very real life situation that is so tragic that it is often taboo for how saddening it is. Amour is as heartbreaking as it is brilliant. Michael Haneke’s masterpiece approaches a very real life situation that is so tragic that it is often taboo for how saddening it is. Georges (Jean-Louis Trintignant) and Anne (Emmanuelle Riva) are a couple in their eighties who are now retired music teachers. Their idyllic lives in Paris are turned upside down when Anne suffers from a stroke that leaves her paralysed on one side. As her health starts to dramatically deteriorate both physically and mentally, their relationship changes and their love is challenged. Amour couldn’t be anything but a masterpiece considering it was the winner of Best Foreign Language Film at the Academy Awards earlier this year and also the winner of the Palm d’Or at the 2012 Cannes Film Festival. Haneke’s film is just wonderful, but a harsh lesson in our mortality. It stirs within you some sad truths that we will all have to face one day and how nobody is immune to what is to come before the end. Amour looks at how love can change in these harsh circumstances. The script is very beautiful, as it contains all the frustrations of the situation but doesn’t forget that these frustrations are all brought on by a very powerful lifelong love. The ending of the film is almost startling, but really quite perfect. Haneke’s direction is just beautiful. Apart from one scene at the very beginning, the whole film takes place inside the couples Parisian apartment. However, as a member of the film’s audience you do not become bored of being in the same place the whole film. Haneke finds a way to make every scene feel different than the last with different lighting and different positioning of the actors in each scene. You feel like you know the apartment as if it was your own by the end of the film, but not once are you sick of being in it. Amour is predominantly a two person film as the movie revolves around Jean-Louis Trintignant and Emmanuelle Riva’s characters. Trintignant is wonderful as Georges. What is particularly wonderful about his performance is how his character changes throughout the film. With his wife’s decline in health, you gradually see the person who he is wearing down as well, Scene by scene he loses more of his spark for life and gradually gets more and more worn out by love and life. Emmanuelle Riva is absolutely superb as Anne. While her body wears out, Riva says so much more with her facial expressions than her paralysed and deteriorating body could ever say. She commands the viewer’s sympathy at all times and you feel as attached to Anne as Georges does. 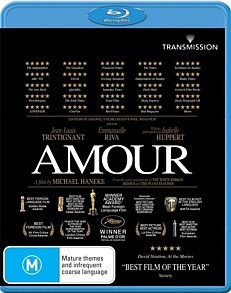 There are three blu-ray featurettes which give an insight into the making of Amour. These are really beautiful as Amour is quite different from other films as the two main characters are both in the eighties. They both have incredible stories to tell in regards their experience on the film and watching Michael Haneke at work is an absolute treat.